The Philippine Air Force received first four Huey II upgraded helicopters in June 2014. Image courtesy of RoyKabanlit. Bell Huey II is a modernisation of UH-1H multi-role helicopter. Image courtesy of EugeneZelenko. Iraqi Air Force received Huey II helicopters in 2007. U.S. Air Force photo/Senior Airman Julianne Showalter. The Huey II helicopter has a maximum cruise speed of 196km/h. Image courtesy of Guille n95. Huey II is an upgraded version of Bell UH-1H multimission, medium-lift helicopter, designed and manufactured by Bell Helicopter, a subsidiary of Textron. The upgrade is intended to provide improved performance over the standard version. The helicopter can be configured for a variety of missions, including troop transport, cargo, search-and-rescue, special operations, disaster response and firefighting. The UH-1H Huey II modernised helicopters are used by a number of armed forces worldwide. Combining a modernised airframe of the basic UH-1H helicopter and Bell 212 components, the OEM-standard Huey II upgrade offers lower direct maintenance costs and greater mission flexibility. It is equipped with new features such as increased horsepower, crashworthy seats, multifunctional interior, new wiring and digital cockpit. The helicopter has a two-blade, semi-rigid main rotor and a two-blade tail rotor. It is also equipped with a new skid type landing gear. It has an empty weight of 2,552kg and cargo hook capacity of 2,268kg, and can carry a useful load of 2,210kg. The internal and external maximum gross weights are 4,763kg and 5,080kg respectively. The cabin has a volume of 6.2m³ and its interior can be configured according to the mission requirements. The Huey II is operated by one or two pilots and can accommodate up to 14 personnel. The crew section is equipped with jettisonable doors and new wide windscreens. The wide sliding doors of the cabin facilitate easy loading and unloading of cargo. Four large windows fitted to the cabin offer improved visibility. The Huey II’s digital cockpit is integrated with NVG (night-vision goggles) capability and multifunctional displays. The helicopter is equipped with several navigation and communications equipment, including UHF and VHF communications systems, intercom, KFS-599A control head, KR-87 automatic direction finder (ADF), KCS-55A compass, KLN-900 global positioning system (GPS), KT-76C transponder, and ELT-A406 emergency locator transmitter. The pilot’s instrument panel consists of radar altimeter, KI 229 radio magnetic indicator, pictorial navigation indicator, and turn and slip indicator. The large, flat cabin floor area can be reconfigured with multiple structural assemblies and hard points to provide multi-role flexibility. The helicopter can be provided with three-place litter, high-skid gear, cargo hook, hoisting and armour solutions. The Huey II offers improved safety over the standard UH-1H and comes with safety equipment, including jettisonable crew doors, new crash-resistant fuel cells, wire-strike protection system, rollover bulkheads, autorotation, and transmission system with chip detection and debris collection. The multi-mission Huey II platform is powered by a Honeywell T53-L-703 turboshaft engine, which generates a take-off power of 1,342kW. It is installed with AC and DC power distribution systems. Standard fuel capacity of the helicopter is 799l and an auxiliary fuel of 568l can be carried optionally to increase the helicopter’s range. The upgraded engine offer increased power, extended time between overhaul and reduced maintenance costs. The modified helicopter has a never-exceed speed of 206km/h, a maximum cruise speed of 196km/h and a range of 455km. Its service ceiling is 4,940m and its IGE and OGE hover ceilings are 3,839m and 1,626m respectively. The helicopter can stay in air for up to 156 minutes. Bell Helicopter agreed to deliver 24 Huey II modernised helicopters to the US Air Force (USAF) in February 2005. The Rio de Janeiro state government in Brazil awarded a contract for a Huey II helicopter for the Rio de Janeiro Civil Police in February 2008. The US Government delivered four Huey II helicopters to Yemeni Air Force in 2011. The Government of Lebanon requested a possible sale of six Huey II helicopters and associated equipment for $63m in July 2012. 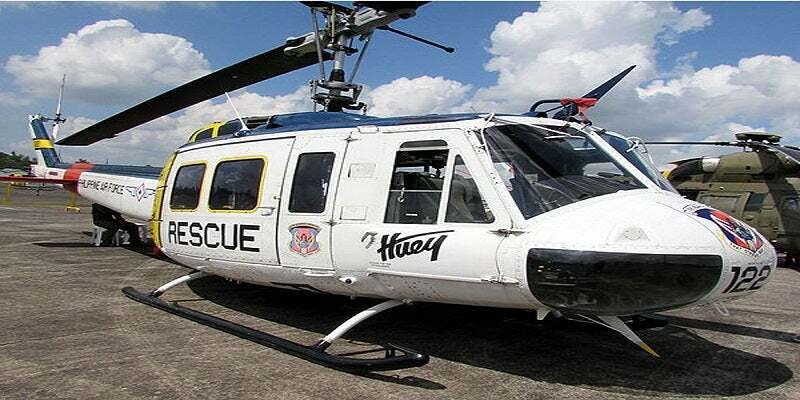 The Philippine Air Force received first four of 21 ordered Huey II helicopters in June 2014. In September 2014, Lebanon requested for 18 Huey II helicopters and spare parts under a $180m foreign military sale. The US Department of Defense awarded an $18.9m foreign military sales contract to Bell Helicopter in March 2016 to deliver three UH-1H Huey II helicopters for Lebanon. The Colombian Air Force received seven Huey II upgrade kits for their UH-1H fleet, as of March 2016. The Kazakhstan Armed Forces took delivery of its third UH-1H Huey II utility helicopter from the US in April 2016. The US Department of Defense awarded a $34.54m foreign military sales (FMS) contract to Bell Helicopter to supply five Huey II helicopters to Uganda by the end of 2017. The Kenya Air Force took delivery of six Huey II helicopters from the US Government in November 2016.